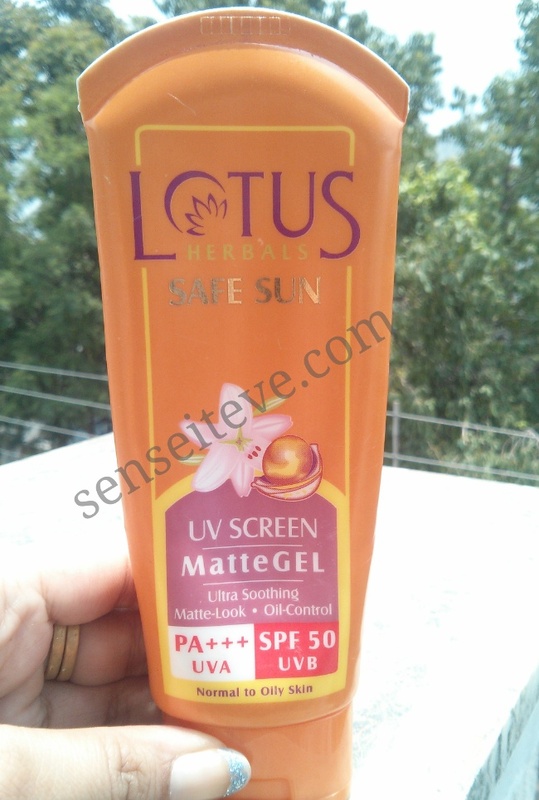 Today I’m sharing my experience about “Lotus Herbal Safe Sun UV Screen Matte Gel SPF 50” . I remember using lotus sunscreen forever 😛 I tried to use lakme one also in my college time but Lakme sunscreen sting my eyes 🙁 . So I always trust Lotus Herbals when it comes to sunscreens. Without any further blabbering I would share my experience about my HG sunscreen. A gel based sunscreen that’s so light that it almost vanishes from your skin and leaves a never before matte feel. Especially for oily skin. – See more here (link). 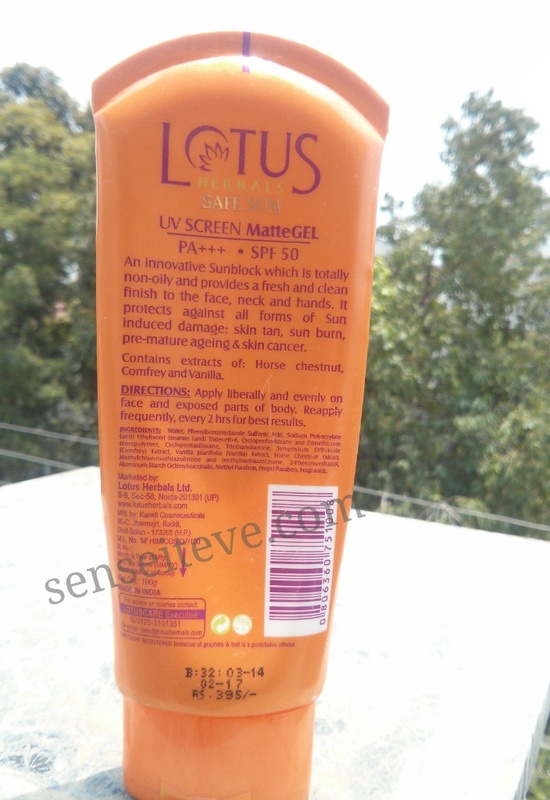 Texture of Lotus Herbal Safe Sun UV Screen Matte Gel is medium consistency semi-transparent gel like which is not at all sticky and it gets absorbed in skin as soon as you apply it. Very light on skin and doesn’t feel like a film on skin. It really keeps the skin matte for a long time and doesn’t ball up on applying any product on it. It comes in a typical lotus herbal sunscreen orange colored opaque tube packing with sturdy shut-it cap which is quite travel friendly and I always carry it in my bag. It doesn’t make my combination skin shiny at all and keeps it matte. Check out the swatches. Doesn’t feel heavy on skin or doesn’t make sticky film on skin. SPF 50 with PA+++ UVA protection.. just perfect for me. Doesn’t irritate my skin at all and doesn’t sting my eyes. Keeps skin matte and controls oil at good measure. Doesn’t ball up when topped with any other makeup product. Gets quickly absorbed in skin as soon as you apply it. Stick to all its claims. It is sunscreen not sunblock so you might need to reapply it. Despite all its cons it’s a hit for me a 5/5. I would always repurchase it and I would recommend it to all skin type beauties. Oily skinned and combination skinned girls Please please do check it out once. Have you used “Lotus Herbal Safe Sun UV Screen Matte Gel SPF 50” yet? Do you like it? What is you HG sunscreen? Please leave in comments section. This is my HG sunscreen. Affordable yet effective and perfect for those with combi-oily skin.